This year has been flying by and now that we are approaching the 1/2 way mark, I find that I’m going to revise some of my personal priorities for this year. Things often do change in ways we can not predict months in advance. So, I’m going to provide you a list of my new Personal Priorities for 2014. Some of these will be the same as I have been working on, some have been removed and some added. One thing I always tend to do is check in and re-evaluate. 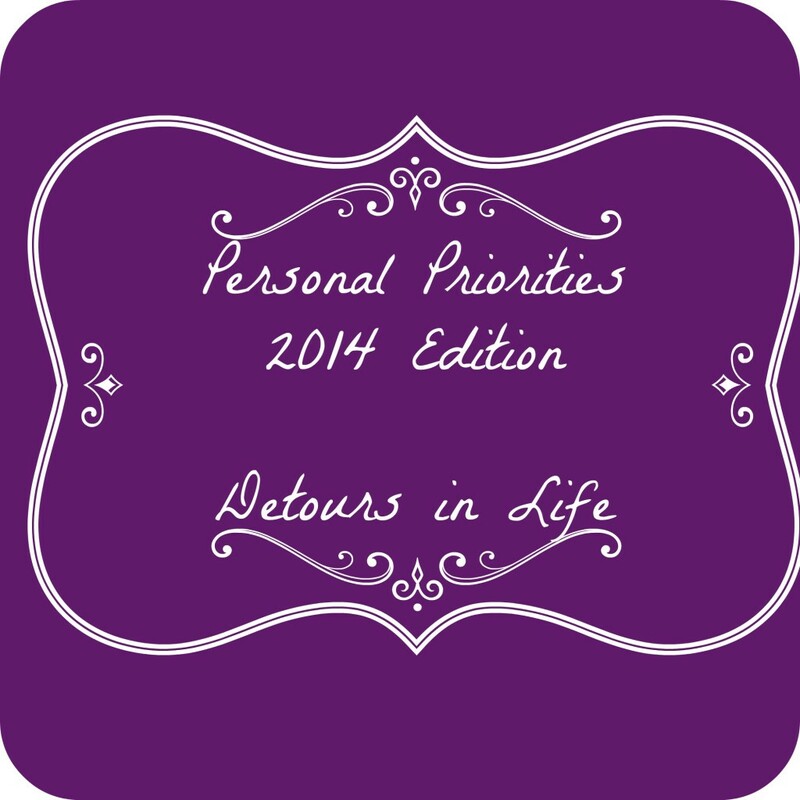 Personal areas: I have altered the personal priorities just a tad. I’m not going to place stress on myself at this point to loose 30 pounds. I will be happy if I can loose 15 pounds before the end of the year. I have also been having a lot of issues with anxiety and depression from my Rheumatoid Arthritis. I am currently not on any medication for my RA due to having a reaction to the previous medicine I was on. This makes 4 medicines tried in a little over a year and all 4 have either failed or the side effects have been too much or I’ve had a reaction to the medication. When I visited my doctor in April, he wanted to try one more medication. He did not discuss with me the possibility of me going back to work or acknowledge the fact that I now have horrible headaches from my neck and shoulders. I decided to write him a letter expressing my frustration and I got a response back that he basically didn’t care. So, I will be looking for another doctor. In the meantime, because my current doctor also decided to tell the insurance company that I’m able to work even when I’m no better than I was over a year ago, I have lost my benefits and will need to find a flexible full time work at home position to make ends meet. Business areas: This month, Family Vacay and Detours in Life saw new themes installed. I am getting better at customizing CSS and themes. I have also been working hard to launch a brand new site that will also be a business for us, Family Time Travelers. As for the dog sitting business, I have had three dogs over the weekend and I have a reservation to keep a dog for 5 weeks this summer while his family goes out of the country. Family areas: I am still working on this area. The kids are now out of school for summer. I hope that I can spend some quality time with them. However, they will be attending summer camp three days a week so that I can work on the sites and also look for a job online. I am also hoping the structure of going to camp will help my daughter since she craves routine and structure. We lost a family member this month, Chloe Cat. I had to make the hard decision to put her to sleep after 14 years of trying to give her a good life even if she peed on everything in site. Home areas: The home areas, well, I’m getting better with the cleaning once we got the house finally clean in all rooms at the same time. We have had to move up the renovation of the kids rooms. We are working on my son’s room right now. We have painted and pulled the carpet up. We will be putting down the same floor we put down in the new office. We will be doing the same to my daughter’s room once we return from vacation. The downstairs will have to wait a bit more for me to finish up the dining room and entry way.